A full and in depth review of IPVanish in 2015. Looking at their service, speeds, policies and more. A thorough review and opinion of their VPN service. An updated IPVanish Review from 2016 is available. I first did an IPVanish review way back in November 2013 and found them to be one of the better VPN providers out there. The service and speeds were excellent and aside from a few software issues that got rectified in super fast time, I was happy to recommend IPVanish for your VPN use. Over a year and a half later and I’ve been making use of their service to bring you an updated review for 2015. Find out how they measured up and how they’ve progressed in that time. The IPVanish website has evolved in the time since my last review, while the previous incarnation was entirely usable and well thought out, the team have been hard at work and in the period between my last review have launched an entirely new site. Prices of everything tend to go up these days, as months and years pass companies are always increasing package prices no matter what the service, be it your cable TV package, your mobile phone or any other service or utility, price rises are almost guaranteed. Luckily the VPN market is one exception and as VPN providers aim to compete on price IPVanish certainly haven’t tried to squeeze your wallet. The prices are exactly the same as in November 2013 which is excellent news for you as a consumer. A monthly package is US$10.00 (Approx £6.48), 3 months are US$26.99 (Approx £17.49) and a full 12 month package comes in at US$77.99 (Approx £50.53). In comparison terms these are very competitive prices, especially when you consider the vast array of servers that IPVanish have available. While I’d like the option of a 6 month package, there is still a saving to be made by buying a recurring 3 month package and an even greater one taking the full year service. The website set up guide area is still extensive and covers the main systems, all major devices including Windows, Mac, Android and now iOS have custom software available to download. In our previous review iOS software wasn’t available so for those iPad and iPhone users this will be a welcome addition. A lot has changed since I did the last review of IPVanish and it appears they are regularly updating both their service and software. This is actually a rather good sign that they are committed to their customer base and improving their service. In fact within the previous few weeks to writing this review we promoted IPVanish to the top of our comparison table due to their continued customer enhancing efforts and overall quality of their service. One of the major changes is the introduction of an app for iOS devices, this means that both the iPhone and iPad are now covered with custom software. Software is still and always has been available for Windows, Mac and Android users. Some small changes have occurred on the Android app making it more functional with bigger more notable changes on the Windows software. IPVanish offer the major VPN protocols including PPTP, L2TP/IPSec and OpenVPN. Their custom Windows and Mac software allows changing between the protocols easily from within the main screen and the Android app follows suit with many providers apps and automatically connects using OpenVPN. OpenVPN is considered the most secure protocol for VPN use. The overhaul of the Windows software is one of the main advantages since I last reviewed the IPVanish service and although their software was fully functional and worked, it lacked some final polish. IPVanish responded to the last review by fixing some of the issues raised in super quick time, however one area of concern was due to the mass of servers and because of this the old software struggled to report back their speed/ping which made the feature rather useless for servers at distance. This issue has been corrected in the new incarnation and improves the use of the software greatly. The introduction of various methods to find a server is another bonus of the updated software. It is now possible to select servers by use, eg; fastest server, servers for US gaming or media services such as Hulu, server for UK gaming or media services such as streaming BBC iPlayer, ITV Player, Sky Go and the wealth of other online TV services. There is also the possibility to see the full server list and a map view which as a visual aid is certainly a benefit. In terms of unique selling points one of the major pluses to the IPVanish service is the large range of servers they have. They are regularly adding new locations and appear to be expanding at a rate of knots. I am always surprised no matter which country I visit to find a local server. For those who travel a lot or who aren’t located in one of the technically “standard VPN server” countries, IPVanish will make a refreshing change. If you have a specific need for a range of locations then there are very few other VPN providers who can compete in terms of locations offered. I’ve personally used IPVanish in the UK and in Malta and Bulgaria while travelling without issue. P2P and Torrent use for downloading copyrighted material is against the terms of service of IPVanish and while this is to be expected, one area that some users request is the ability to download whatever they wish. 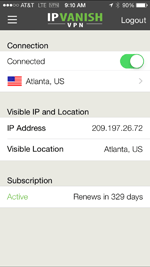 Although this is the case IPVanish assign random IP addresses from a pool of over 14,000. These are shared between users giving the most secure browsing experience. In a nutshell this means that many users can be connected using the same IP address and so anything you do on the net can’t be singled out to yourself. P2P use in itself isn’t banned and is accessible via the IPVanish service. I’ve made use of IPVanish sporadically over the past few months but increased my usage for the purpose of this review to see how the service stacked up on a daily basis. I’m pleased to report that I didn’t notice any issues with connection or speed. IPVanish was one of the better providers back in 2013 and aside from a few issue I had with their software that mainly came down to final polish the service itself raised no problems. In the time between the last review and now nothing in terms of quality of service has deteriorated and the Windows software itself has been improved greatly to give and all round smoother user experience. One feature of the service which trumps most other providers is the wealth of countries available to connect to. With over 60 locations and more being added on a weekly basis they are one of the biggest providers in terms of access points with only one other provider to my knowledge having more locations available. For frequent travellers, those that want access to a wealth of online content and those who just like a large choice IPVanish certainly provide in the location stakes. The IPVanish Windows software automatically uses its own DNS servers which protect from DNS leaks. This is a good addition to the software although it would of been nice to be able to enable or disable this feature giving the user greater say over how their DNS requests are handled. One issue I suffered using Windows 8 was when forgetting to disconnect before shutdown, the IPVanish DNS servers remained in the connection properties causing my local connection to not function at all on next boot. This would require manually removing them which could cause an issue for the unassuming new user. After speaking with IPVanish support running the software again will restore the DNS servers to default. This is a difficult issue for software to address, although still one that could be confusing for new users. Testing for this review included a variety of purposes including everyday browsing while abroad on one of their local servers, watching UK streaming services such as BBC iPlayer and 4OD etc plus other general internet tasks such as using Skype, FTP services and general everyday browsing activities that the average user will likely carry out on a day to day basis. I mainly made use of their Windows software with some minor Android use. The Android software is basic but does the job it is intended to do. Connection on Android was reliable and stayed connected when on a dedicated Wi-Fi connection or when using mobile browsing such as 4G. One huge gripe I had with IPVanish last time I reviewed them was their sporadic localisation of connection points. On more than one occasion I found connecting to a certain location reported back as a completely different country on location services such as IPLocation.net. It appears IPVanish have been hard at work rectifying this issue as the majority of servers now report in the correct location. This is great news for unblocking localised services such as streaming sites like Hulu in the US and US Netflix for Australia customers. Using IPVanish for the past 18 months has given a good overall impression of their general speeds. Increasing this usage in the last few weeks for the benefit of this review gave great results and everyday browsing, general internet use and the daily tasks most of us will carry out caused no issues for the service. General use was pleasing and I suffered no issues or noticeable slow downs. Towards the end of 2014 we started to run regular speed tests of the UK servers of most providers we have everyday access to. IPVanish consistently came out in second place with first place actually being taken by a server physically closer to my location. Out of the remaining providers with a server in the London area of the UK they were in fact generally the fastest provider. Gauging peak speeds of servers at distance is difficult due to physical limitations but in general IPVanish were suitable for downloading purposes over a range of countries local to my location in the UK. To put providers through their paces we download a 10gb test file via a download manager opening the most concurrent connections possible. The results below are from a UK based connection and so any results achievable for yourself will be based on your physical location. All tests were carried out using OpenVPN via UDP with 256 bit encryption. Our test internet connection is 152 mbps and as such would be the maximum available speed. The servers tested in order from top to bottom are UK, France, Netherlands, Switzerland, New York – US, Miami – US, India and Sydney – Australia. Speeds given in the image above in the right hand column are in KBps (kilobytes per second). UK – 102 mbps, France – 106 mbps, Netherlands – 111 mbps, Switzerland – 31 mbps, New York – 56 mbps, Miami – 35 mbps, India – 34 mbps, Sydney – 23 mbps. Some excellent speed results from IPVanish especially with servers in close locations such as the UK, France and Netherlands. The Swiss speed result was a little disappointing at the point of testing but servers such as New York received excellent results for such a distance. Locations as far flung as India and Australia suffered obvious speed loss due to the massive physical distance but surprisingly they were still very usable and fast considering the locations. IPVanish offer standard encryption across their range of package lengths. There are no higher tier accounts with better encryption that you find with some other providers, this I find to be a more suitable situation. A good encryption standard is available when using the custom software. The control channel uses TLSv1/SSLv3 DHE-RSA-AES256-SHA with a 2048 bit RSA key. The data channel uses a AES-256-CBC cipher. It’s quite refreshing to see such detail in the policy area and one in which some other VPN providers fail to adequately make clear to their user base. VPN providers are not made equally and knowing what is acceptable and what the service stores or doesn’t store before you sign up is a big plus. The policies laid out by IPVanish are detailed and should be read thoroughly by yourself before signing up to the service. On glance there appear to be no major issues and in areas such as logging, users will be pleased to know that they state they do not log any traffic or use of their VPN service. IPVanish are a US company and so billing information is stored and will be handled in the US. While data protection laws are similar to other developed nations, IPVanish make it clear that they may not be exactly the same. Those who are overly concerned about US data storage may wish to consider this but for the majority of users this will be an non-issue with many large companies used daily also storing billing data in the US. P2P use is allowed on the IPVanish network, although downloading or distributing files that infringe on copyright is against the terms of service and so it should not be used for illegal purposes as would be expected with any commercial VPN provider. While IPVanish do not store any usage logs I was not able to ascertain if connection logs are stored. It would be useful if IPVanish could clarify this in their policies. IPVanish offer support via a ticket system like the majority of VPN providers. Although they offer a live chat support this is only available within US business hours between 9-5. With IPVanish targeting a global audience and also having servers in a large selection of worldwide countries it would be nice to see this live support extended to 24 hours a day for those in time zones that don’t work well with US local time. Although their live chat support isn’t 24 hours per day their email support is and in fact it is actually available all year round, even on national holidays. This is a large plus for the service because in many instances big holidays such as Christmas are not celebrated in every country worldwide and for users in those countries it can be disappointing to find other providers closed on local holidays when you have a question or issue with service. While IPVanish offer 24 hour a day, 7 day a week, 365 day per year email support it seems strange that they don’t extend this luxury to live chat support and would be something I would like to see rolled out in the future. The speed of response outside of US working hours to email support tickets was rather quick with my test contact taking 1 hour and 10 minutes to receive a response. Pretty good going considering it was around 7am in the US at the time of contact. IPVanish have gone from strength to strength. For a provider that started out only 3 years ago they have increased not only the quality of their service but their percentage of the market. In my previous review of IPVanish in November 2013 I found the service to be both fast and reliable. While the desktop software had some niggles the actual working of the VPN service was top notch. Over a year and half later the service has expanded at a great rate adding more servers and providing a more reliable connection. Speeds overall are fast and reliable and the wealth of connections available will suit almost all uses. IPVanish is suitable for streaming services from abroad such as iPlayer and more surprisingly Sky Go which with some other providers does not work. One area which IPVanish strive higher in than most other providers is their willingness to make changes within a small time frame. Although they appear to be a large organisation that does not cause any bottleneck in their ability to roll out new features or listen to user feedback. In fact after my first review they implemented software solutions within the matter of a week or two showing that they really do listen to customer feedback. IPVanish is definitely a service that will appeal to the everyday user. While they may not be the choice of the security elite, what they do, they do well and they make encrypted internet access and privacy easy for the everyday man and woman. Increasing the uptake in security product use and understanding of online safety can only every be a bonus and the way in which IPVanish do this encourages more general users to protect their online usage. The majority of servers work extremely fast and apart from a slow speed experienced on their Swiss server at the time of testing the rest of their service appear reliable and provide excellent speeds. Support from IPVanish is fast although for a larger organisation I would like to see 24 hour live chat available along side their 24 hour email support. Finding negatives for their service is rather difficult. Apart from a lack of information on connection logs their encryption and policy areas are well thought out and in general thorough. Overall I would definitely recommend using IPVanish and it is one of the reasons why we have moved them to the number 1 spot in our VPN Comparison Guide. An all round great service at a competitive price make IPVanish a well worthy contender for your VPN needs. Now you’ve read our IPVanish review, why not take a few minutes to leave your thoughts about their service in our comments below? Easynews Review: A comprehensive look at this Usenet provider. I don’t understand the speed tests. What do the numbers mean? Thanks for raising that, I hope it is clearer now. Anyone notice the shared pre-shared key these guys use? If you’re after security as well as privacy, this may not be the best option.